As the sun descends each evening onto the Arabian Gulf and the traditions of Ramadan begin, guests are welcomed to join for two variant seating’s, including the breaking of the fast Iftar, from sunset to 8pm for BD 25++, and the Ghabgha dinner from 9pm to 2am, for BHD 27++. Guests can also book one of the Pergola seating areas for private dining up to eight guests (limited to 7 Pergola seatings at a time). For info and reservations, call Tel. New tents seamlessly blending contemporary design with traditional Turkish elements ensure a premium brand of cultural and culinary experience enjoyed with festivities, music, and international cuisines. Valid before 7th May, Early Bird package of the lavish Iftar Buffet costs BD14++ on weekdays and BD16++ on weekends while the Ghabga buffet is priced at BD13.5++ on weekdays and BD15++ of weekdays. Regular package deal for the Iftar costs BD16++ on the weekdays and BD18++ on weekends while the Ghabga buffet is priced at BD15++ on weekdays and BD17++ on weekends. Enjoy incredible live cooking stations, a vast array of international dishes, along with Arabic drinks and a tempting dessert section within the majestic garden set-up of the ART Rotana full of festivities that is sure to delight your friends and family. Iftar is from sunset until 8:30pm while Ghabga starts from 9:30pm-12:30pm for BD21++ each accompanied by live entertainment and the best flavors of shisha throughout the night. Enjoy a wide selection of traditional Bahraini and global cuisines in a modern Arabesque theme overlooking the Arabian Gulf. Iftar is at sunset till 8pm for BD26++ with beverages and Ghabga at 9pm-2am for BD28++ with beverages both enjoyed with a live band for the whole Holy month. A discounted BD23++ for the Iftar and BD 25++ for the Ghabga for groups with a minimum of 30 pax. Shisha is to be requested for BD10++. A large section of the ballroom will have a kids’ club with fun activities, kids between 5-12 years are BD13++ for the Iftar and BD14++ for the Ghabga. 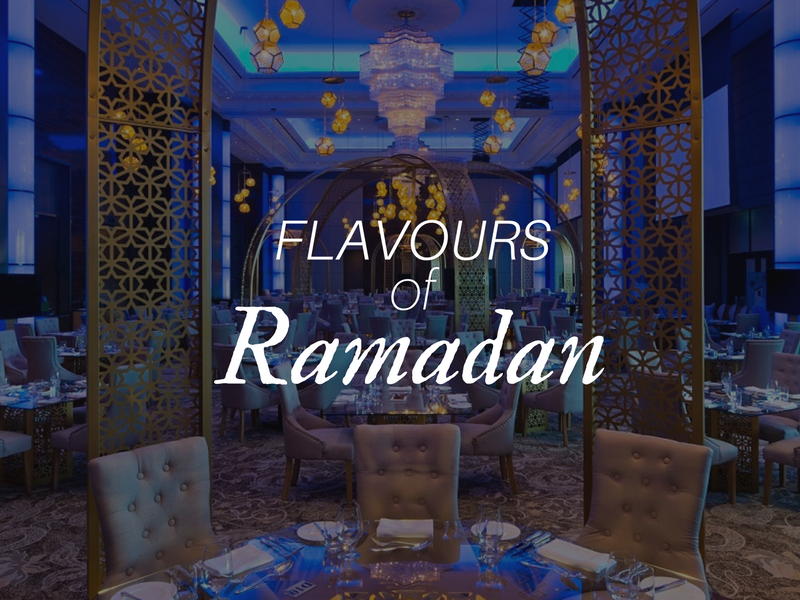 During this Holy month, traditions are revived alongside family & friends to a widespread Iftar Buffet with a feast of Middle Eastern cuisines and a selection of traditional juices, sweets and savouries. The Iftar buffet is at BD11 NET for adults and BD5.5 for kids 6-11 years old. Ghabga is available for private/corporate groups with venues for up to 150 persons. Unique Ramadan decorations, soothing music, and the outdoor ballroom terrace is a swell place for a gathering of family, friends and colleagues during this Holy month. An extravagant spread of Iftar Buffet at the Al Maha Tent, 8th floor, Downtown Rotana is at BD13++ including Ramadan drinks and desserts accompanied by live entertainment. Book for a minimum of 10 between 1st May and 15th May and get the early bird 20% discount. Kids from 6 to 12 years get 50% discount and those below 6 years of age are free. Find the prosperity of Ramadan as the InterContinental Regency Bahrain bring the festivities to your Iftar and Ghabga. Genuine and authentic culinary selections are to be made exclusively by our award-winning chefs, all prepared to your satisfaction. Iftar is served after sunset for BD15++ and Ghabga, upon request for groups, is for BD14++. For info and reservations call, Tel. A wide spread of Middle Eastern cuisines and a variety of Ramadan juices and sweets are presented for the traditional Ramadan Iftar and Ghabga gathering feasts. Daily Iftar at Café mosaic for BD10 NET adults and BD5 NET for kids 6-11 years of age, special group rates are offered for 10 persons and above. Venues are available for private and corporate Ghabga gatherings offered daily from 9pm-2am for BD8++ per person. Enjoy the Iftar and Ghabga buffet at Park Regis Hotel’s Lotus Tent with the true flavours of Arabic hospitality. Join @Swiss-belHotel throughout the holy month of Ramadan for an authentic Iftar and Ghabga buffet at Swiss Cafe Restaurant. While dining on the large selection of Middle East and International cuisine, guests can relax and enjoy live music with an Arabic duo singing along with raffle draws on Thursdays and Fridays. Priced at BD 10 ++ per person, take advantage of a special 1 in 5 offer – book for 5 adults and pay only 4. During the Holy month of Ramadhan, Florence is offering customers a delightful dining experience. Weekends will feature a delectable Iftar and Suhoor buffet including some of your favorite Florence specialty dishes and twisted traditional Ramadhan classics. Meanwhile, weekdays will feature a unique and original Ramadhan special menu. Celebrate the spirit of togetherness during sundown at The K Hotel Bahrain! The sundown buffet can be enjoyed from sunset up to 8.30pm for BD9.9++ per person. This offer includes Ramadan juices, coffee and tea, as per your choice. Children aged 7 to 12 years eat at half price and those aged 6 and below dine for free. Come and enter a world of true Ramadan essence at Elite Resort and Spa’s Noor Tent, a luxurious tent with exquisite interiors and decorations reflecting an Arabic flair. For info and reservations, call Tel. +973 3888 4415. Inspired by the opulence and charm of Arabia, experience Alto’s Layali Ramadan and indulge in a rooftop Ghabga buffet from 8pm to 2am, for BD 15++ per person. The Ghabga buffet will offer a lavish feast of contemporary traditional and regional dishes. From tasty appetizers and main courses to mouthwatering desserts and drinks, against a backdrop of the stunning cityscape.